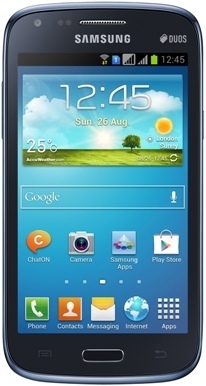 The Samsung Galaxy Core offers rich features and justifies its price. 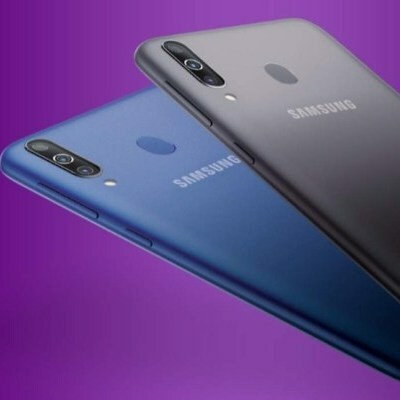 It supports dual SIM functionality, Android 4.1 Jelly Bean OS, dual camera, 1 GB RAM, and 1.2 GHz dual core processor with many more exiting features. It has long battery life too. 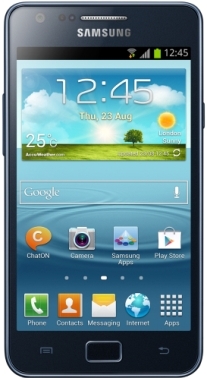 Samsung Galaxy Core offers a low screen resolution compared to others mobiles in its price range. This is a good buy in its price range and offers good features too. Its low screen resolution can be the only reason to avoid. 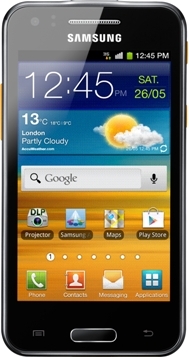 The Samsung Galaxy Core is a beautiful device and will attract many. It is reasonably priced at Rs. 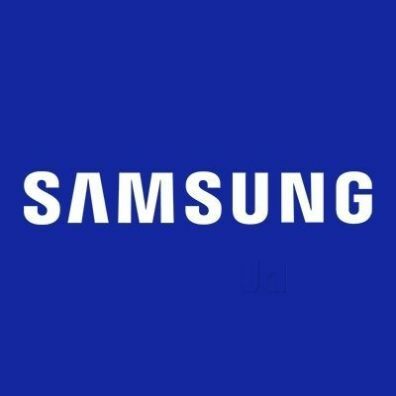 13,520 and is a new addition in the Samsung Galaxy’s family. Its screen size is 4.3 inches and it comes with TFT technology, capacitive multi touch touchscreen with 400 x 800 pixels screen resolution. The dimensions of Galaxy Core are 129.3mm, 67.60mm and 8.95mm in height, width and depth and it weights 124 gm only. Like most other Galaxy devices, the body is plastic material with aluminum curve ring in the front. 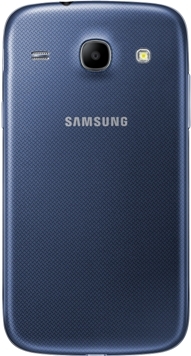 Galaxy Core comes with less dedicated keys, on the right side it has a power/lock key and the left side hold the volume control key. On the top, it has a 3.5 mm earjack and the USB port for charging and Connectivity is on the bottom with microphone. Below the screen is a physical Home key with Back and Menu Capacitive touch keys. Above its screen is proximity sensor next to the earpiece and front VGA camera. But, Galaxy Core lacks with a dedicated camera key. 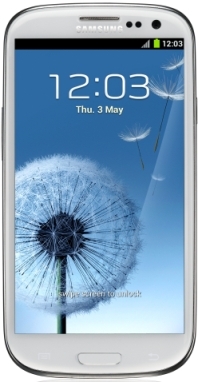 The design of Galaxy Core is simple, attractive and youth appealing. On the back it holds a 5 megapixels camera with LED flash and the speaker grill next to it. 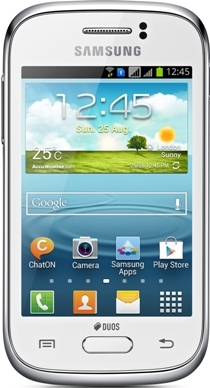 The Samsung Galaxy Core runs on Android 4.1 Jelly Bean operating system. It comes with 1.2 GHz Cortex A5 dual core processor and it has 1 GB RAM. This android version is well supported with this phone. However, there are many phones in this segment which offers the updated version. Galaxy Core comes with motion UI (user Interface) and offers some exiting features. 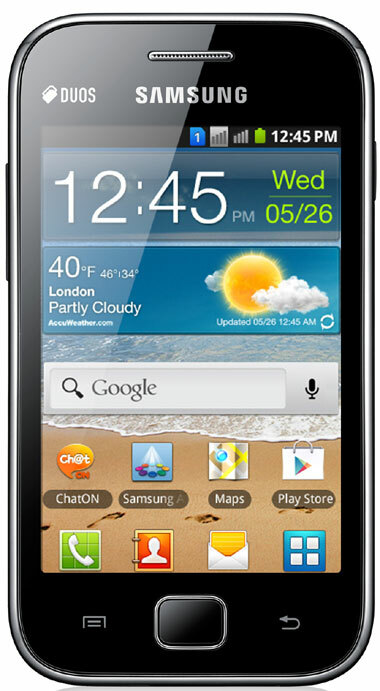 Samsung Galaxy Core comes with a CMOS 5 megapixels camera with auto focus and LED flash. Core also sports a front facing VGA camera and can be a reason of attraction for many. The camera embedded in the devise is fine and image quality is good. Camera captures video too but with VGA effects of 480 pixels at 30 frames per second. This Galaxy Core camera offers multiple shot mode, photo effects and white balance options. It features Geo-tagging, touch focus, face and smile detection too. The overall camera work is good and offers great picture quality. The Samsung Galaxy Core in-built has its own Touch Wiz music player. The same music player exists in all galaxy phones and the sound quality is not compromised. It has the DNSe sound enhancing sound technology and equalizer presets but lacks with 5.1 channel virtualization. The audio quality with the headphones is really good but when on loudspeaker mode the quality falls down. In-built Stereo FM with RDS is best enjoyed with headphones on and can be enjoyed in loudspeaker mode too. The video player embedded in Galaxy Core is simple and easy to operate. But, it gives low resolution to video captures. It supports 3GP and MP4 video formats and the plays video up to WVGA resolution. The videos recorded or downloaded can be played with the video player and they can be transferred to you TV or computer too. Galaxy Core from Samsung offers in-built 8 GB memory space, which is better than its other Galaxy series. Through micro SD card, it is expandable up to 64 GB. SMS and phone book entries depend on the availability of memory space in the phone. 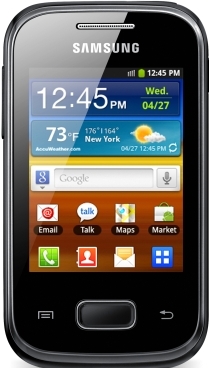 The Samsung Galaxy Core is a high mid range Android phone and is filled with lot many android features such as aGPS, Google Maps, MMS, instant messaging, e-mail and personal organizer. There are in-built options like: Wi-Fi (to enjoy wireless network), Bluetooth 2.1(to share data, photos, videos, etc. with other devices), USB 2.0(to connect you device with TV or Computer/Laptop), 3.5 mm audio jack (to enjoy music, Radio and Videos), the much hyped ChatOn service (enables single and multi-person conversations, multimedia file sharing and even more) and Samsung Kies Air (that help you syncing data with your PC/Laptop). 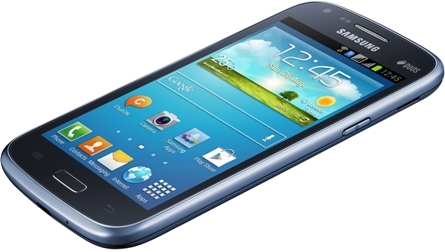 Samsung Galaxy Core has many options pre installed for browsing Internet. These include Layer reality browser, android browser, GPRS, EDGE, 3G and HSDPA 7.2 MBPS. Galaxy Core also features ‘Smart Stay’, with this feature the screen never sleeps if one is looking at it. It also has ‘Smart Alert’, in this notifications for events one may have missed appears when they pick up the phone. ‘Motion UX’, with this it just takes a Shake to update and turn over to mute with simple motion controls. ‘Easy Mode’ that helps one access key functions such as favorite contacts, apps, dialer, etc on the home screen with ease. 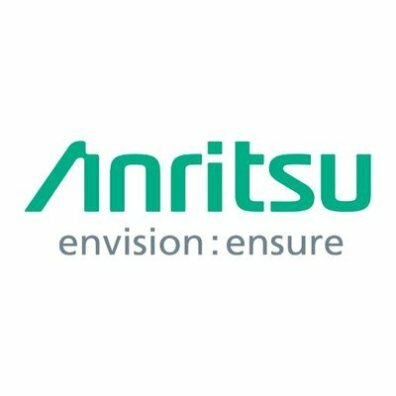 It supports Quad band GSM (850, 900, 1800 and 1900 MHz) on 2G Network and Dual band (900 and 2100 MHz) on 3G Network. Facebook, Twitter and You tube is embedded in it and the social hub offers a fully incorporated one page layout of phone book, IM, e-mail and SNS. Samsung Galaxy Core is power packed with standard Li-Ion 1800 mAh battery, which has done full justice to this dual SIM device. It delivers the stand by time up to 300 hours on 3G. The Talk Time delivered is also impressive which is up to 540 minutes on 3G. 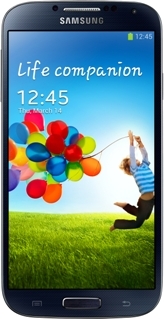 The Samsung Galaxy Core is a good phone in this price range and offers good exciting features. 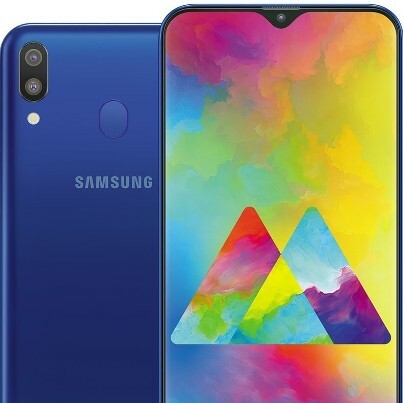 The 4.3 inch screen display is good but screen resolution is bit low, the battery life is good and the features embedded are better and abundant. But there are few options that this phone is missing such as: dedicated camera key and HD video resolution. We give this phone 4 star rating.